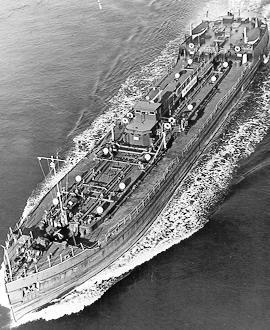 The Chester A. Poling was a coastal tanker, which carried heating oil. She was originally commissioned as the Plattsburg Scocony in 1934. Before becoming the Poling in 1956, she went through one more incarnation as the Mobil Albany. On January 10, 1977 she encountered severe gale force winds and thirty foot seas heading back to New Hampshire after unloading her cargo. The vessel snapped in half in the seas. The bow turtled and sank off Eastern Point in 190 fsw. The stern floated for miles before sinking upright off the breakwater in 75 fsw. The “Blizzard of ’78” relocated her once more and she finally settled in 100 ft of water, having moved several hundred yards. The stern remains one of, if not the most, popular dives in Cape Ann. The Bow, once known only among small groups of technical divers as a deep, dark and dangerous dive, is now regularly visited. In 2006, a documentary was produced that recounts the sinking of the Chester Poling and the early days of diving on the wreck. Visibility on the stern section can vary tremendously but is generally good, on average 20-25′ in the summer and at times, 40-50′ in the winter. Tidal currents can become very strong on the surface, with a more mild current encountered on the wreck. These tend to coincide with tides, so by planning accordingly strong currents can be avoided. There is usually quite a bit of boating traffic in the area as the wreck is very close to a navigational channel. Occasionally the wreck becomes cluttered with lobster traps and along the periphery of the wreck, there can be hang ups from old line. Off the wreck in the sand there is almost as much to see and do. There is a dive store’s supply of lost reels and knives out there. Running a line off the stern area, the wreck of the Gannet is a few hundred feet away. There is quite a bit of random debris to explore, especially on days with good visibility. Inside the wreck the first level below the main deck can be easily navigated without a reel. Light is visible from almost all points with several exit points. There are living quarters on either side of the wreck, with a galley space in the middle. The corridors and crew have small rooms adjacent to them (bathroom, closet, etc) but are small and do not permit easy entry. Further below one deck is the engine room space. Over the years this area has become filled in with silt tremendously and is now a very tight swim. Entering through the large hatches, one can drop straight down and swim aft behind the staircase. A loop heading to either side of the wreck can be easily swum. But beware the you are likely to stir up some silt moving behind the staircase, so your exit will be in lower visibility. The inside is fragile and requires gentle slow swimming to avoid damaging decaying wreckage and disturbing visibility. Swimming forward in the engine area you will quickly run out of space as silt is filled high in this area. At one time a diver could swim between the machinery and bulkhead hull, but as of Jan 2007 this may no longer be feasible. The oil holds can be accessed by dropping through the deck hatches. These are a little tight to get into in doubles and there’s not much to see in them, but it can be done. At the break end of the wreck, the bulkhead has collapsed enough to permit entry into a hold through this way. The bow section tends to be a less interesting dive unfortunately, and this is because the bow is nearly turtled. The location of the wreck is also in a silty area so the dive tends to be very dark even on the brightest of days with 15 feet of visibility at best (usually). The bow anchors can be seen as well as the corresponding broken end. The wheelhouse is almost completely buried but parts can be seen still down in the mud. This section is smaller than the stern at just over 100 feet in length. The top of the wreck can be reached in about 155-160′ with the bottom around 180-190 depending on the tide.